Danville Firefighters are honoring their fallen brothers in an annual event on Saturday, October 20th, 2018. A Fallen Fire Fighter Memorial ceremony begins at 8:00 a.m. at Fire Station #3, located on North Griffin Street. Albert Holmes and Albert Shanks, who died in a February 17th, 1915 fire at the Odd Fellows Building in Danville. Both men were buried under debris. Holmes was pronounced dead at the scene. Shanks was transported to a hospital, but was pronounced dead. William Schroeder died on November 1, 1936 while venting a roof with an ax during a structure fire. He became ill, got off the roof and died of a heart attack en route to a hospital. Leo ‘’Buck’’ White died while hitting hot spots at Allen Chapel on January 26th, 1941. While on a ladder a large piece of stone molding fell, crushing White and he ladder. Gene Anderson responded to Vermilion and Voorhees for a house fire on August 11th, 1976. After the fire was out he and his crew set up portable lighting and returned inside to the second floor where Anderson collapsed. Fellow firefighters started CPR but efforts to save Anderson were unsuccessful. The general public is invited to attend Saturday’s memorial. 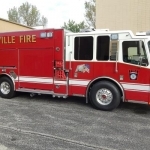 If you are unable to be there, Danville Fire Fighters say the ceremony will be streamed live on the Danville Fire Fighters Facebook page.